Population growth, a massive expansion in access to basic education, and growing household incomes are all contributing to tremendous growth in the demand for higher education in sub-Saharan Africa. By 2050, 2.4 billion people will live in Africa, up from just over one billion today, with Nigeria set to become the world’s third most populous country. And by some estimates the African middle class has tripled in size over the past 14 years, growing from 4.6 million households in 2000 to 15 million today across the continent’s 11 largest economies. The current higher education enrolment ratio for sub-Saharan Africa is 8%, and a 2015 action plan aims to increase participation to 50% of college-aged students by 2063. A great deal needs to happen in order for the continent to reach that ambitious target: existing universities will need to expand and strengthen their programmes, new institutions will have to open their doors, and new delivery models will be needed to bring higher education to many more African students. 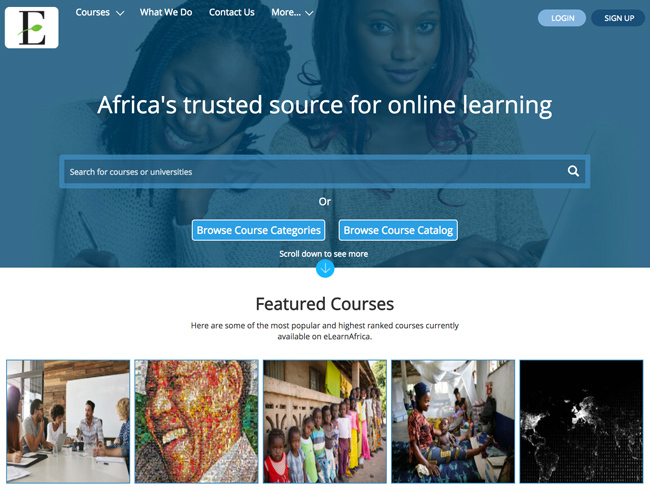 A new agreement announced this month between eLearnAfrica – a new online course provider – and the Association of African Universities (AAU) aims to do just that by expanding the online programmes available to students at the AAU’s 380 member-universities. eLearnAfrica delivers MOOC-type courses (Massive Open Online Course) from major providers and institutions, including EdX, FutureLearn, Harvard, MIT, and Cambridge, as well as professional development courses in 175 high-demand vocational and career paths such as software development and business administration. The initial focus of the new partnership will be to make the more-than-1,000 courses currently offered by eLearnAfrica available to students at AAU universities, with the goal of expanding the learning options available via all member institutions. But association members will also have access to the online learning systems and support of eLearnAfrica in bringing new programme options online, suggesting that the new MOU with AAU may cast eLearnAfrica in the role of an online programme management (OPM) provider – that is, as an expert partner that can help traditional institutions bring their programmes online more quickly and effectively. OPMs (and MOOC providers generally) have been catalysts for major expansions of online learning in other world markets, including in the US, and that may be the more significant, long-term prospect emerging from the new eLearnAfrica-AAU MOU. More broadly, online learning is increasingly seen as an important counter to some of the persistent challenges that limit access to higher education for African students, including high costs, limited university spaces, and access to higher education in proximity to the student’s home community or region. This entry was posted in Africa, Online Learning, Regions and tagged online learning in Africa, Sub-Saharan Africa, student enrolment, distance learning, international students.